While reading VancouverHistory.ca I always check out the sidebar where there’s a teaser for the book, the Street Names of Vancouver by Elizabeth Walker. It asks, “Who was Davie? Why do we have a Broadway? What street was named for a Spanish Secretary of State?” and until the other day my previous knowledge of the origins of some Vancouver street names had floated like a McBarge out of my memory. Walking down to Waterfront Station the other day John and I paused in the hallway to get some change out for a Jugo Juice and when I looked up at the side of the wall. 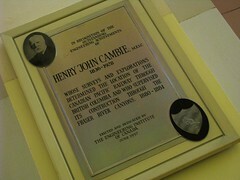 It was someplace I had never thought to look before but there was a plaque dedicated to Henry John Cambie. Cambie, a surveyor born in Ireland, was charged with the task for bringing the CPR (Canadian Pacific Railway) to its terminus on the coast, which he decided would be Vancouver. Plotting the route for the CPR through the Fraser Canyon and out to Burrard Inlet was no easy task. In fact his survey mission began at Yellowhead Pass, through the Rockies and across the Continental Divide. I have a great photo of me sitting on a monument marking the Continental Divide, one side of me in Alberta the other in BC. However this was from my rebellious teenage years and I simply cannot justify the outfit I was wearing at the time (that and we were on a two week long camping trip) but I digress. In honor of Henry John Cambie, Cambie Street in Vancouver, Cambie Road and H.J. Cambie School in Richmond are all named after him. The history around here is rather new compared to other parts of the country but it wasn’t until the last century that it started to build up and boom. Talented people like Cambie helped secure the routes that would get people and supplies from our Pacific ports up, over and through the Rockies, truly building BC. Ah yes the McBarge, I remember going their during Expo86. And if you take the WestCoast Express into Vancouver you pass by it’s final resting place every day. It’s a pity they never used it, though I did hear rumors that someone was going to use it for a night club. As for Cambie, I like finding out how parts of Vancouver came to be, ie the naming of streets etc. Thanks, B. I look forward to hearing about the mix of Spanish and English names sprinkled throughout the Canadian Southwest/US Northwest. Miss 604, please email me again. Canada Blog Friends pays even more money now via PayPal. Your help is needed – seriously I cannot believe how many blog rolls you are on. You are like the quintessential West coast female blogger in Canada. Henry Cambie, my great great grandfather was one of the great pioneers helping to forge the nation we have today. Our history seems so long ago, but in reality is just around the corner…. My g-g-grandfather was Henry J. Cambie’s brother! Love to touch base on the Cambies. Janet & S. Raymond – haha! henry was my g-g- grandfathers brother too! Seems to be a few of us floating around. Can’t wait to go to Canada visit Cambie!